From amulets, flying carpets and magic wands to cold fusion generators and ray guns, magical tools have always fascinated the popular imagination. They also fascinate mages, for they can actually make these daydreams real. But the universe no longer accepts powerful magic. Where wizards once forged swords that could cleave mountains, now they must be content with remote-control cars. Or must they...? Can Paradox be thwarted long enough to once more allow the forging of weapons of old? 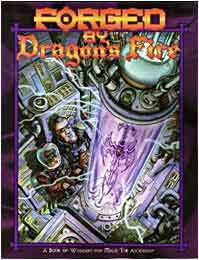 Forged by Dragon's Fire is a book of Wonders, presenting advanced creation rules for Artifacts and Inventions, Charms and Gadgets, Fetishes, Periapts, Talismans and Devices and more. Also included are expanded rules for Familiars, companion spirits manifest in flesh who hold a key to piercing the Storm that rages between the worlds.